최근 수년간 많은 북한 난민들이 한국이나 중국이 아닌 제3국에서 난민 신청을 진행하게 되었다. 그 가운데 대부분은 1차 심사 단계를 통과하지 못하고, 몇몇은 각국의 법원을 통해 항소를 하였다. 이 글에서는 미국, 영국, 캐나다에서 망명 신청 후 난민으로 인정받지 못한 북한 난민 관련 판결문들을 살펴본다. 각 국에서는 각기 다른 법적 심사 기준을 통해 북한 이탈 주민은 남한 법으로 인하여 국제법이 인정하는 난민의 정의에 부합하지 않는다는 결정을 내렸다. 미국 법원에서는 재정착이론을 통해, 남한에 이미 정착하여 영구 거주의 제안을 받은 경우에, 국적부여 여부와 관계없이, 난민 인정이 불가하다고 결정하였다. 다만, 남한에서의 박해나, 근거있는 박해에 대한 두려움이 있는 경우에는 예외임을 인정하였다. 또한 미국은 남한에 정착하지 않은 경우에는, 북한 탈북민의 난민 지위를 인정하고 있는 국가이다. 영국의 법원에서는, 남한의 헌법상 남한의 영토는 한반도를 포함하며, 또한 남한의 국적법상, 한국인 부모에게서 출생한 경우 남한 국적 취득이 가능하다고 보았다. 따라서, 북한에서 출생한 경우, 남한 국적이 부여되므로, 난민 보호를 거절한다는 결정을 내렸다. 캐나다 법원에서도 북한인의 남한 국적 취득은 자동적이므로, 난민 자격 부여를 거부하였다. 이처럼, 세 국가는 각국의 법원 판결을 통해 북한 난민의 입지를 더욱 좁혀가는 것으로 보여진다. 다만, 미국의 경우, 미국법상, 북한 난민이 남한의 국적을 취득할 수 있다는 점으로 인하여 영국과 캐나다처럼 자동적으로 북한 난민을 남한국적민으로 취급하고 있지는 않다. 이 글은 각각의 판례를 살펴보고, 각국 법원의 북한 난민에 대한 이해를 분석해 본다. In recent years, numerous North Korean refugees have sought to find refuge in countries other than neighboring China and South Korea. Most recently, North Korean refugess have initiated court proceedings in the U.S., England, and Canada to become recognized as refugees, according to the international standard. However, most cases have been unsuccessful, and this paper will deal with the appeals decisions of each country. In the U.S., the “firm resettlement doctrine” has guided courts in determining cases dealing with North Korean refugess. 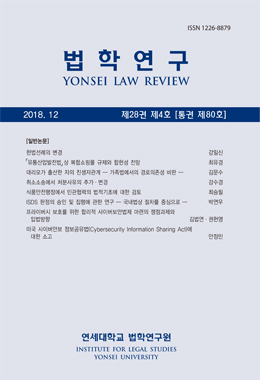 In many instances, courts have found that North Korean nationals have firmly resettled in South Korea, which is evidenced by several factors, including an offer of permanent residence. In England, the immigration courts have looked to South Korea's laws regarding North Korean escapees, and determined that albeit born in North Korea, South Korean law provides for citizenship according to is Constitution and citizenship laws. In Canada, courts have ruled that North Koreans are automatically able to obtain South Korean citizenship and thus have refused to grant refugee status to North Koreans. Each with different analyses, the courts in the above-mentioned countries have reached the same conclusion that North Koreans are not refugees who cannot be awarded asylum, which has radically narrowed the possibilities for North Koreans.